It’s been a disastrous month for breakfast in Sydney, with two of my favourite new cafes closing their brekkie business. 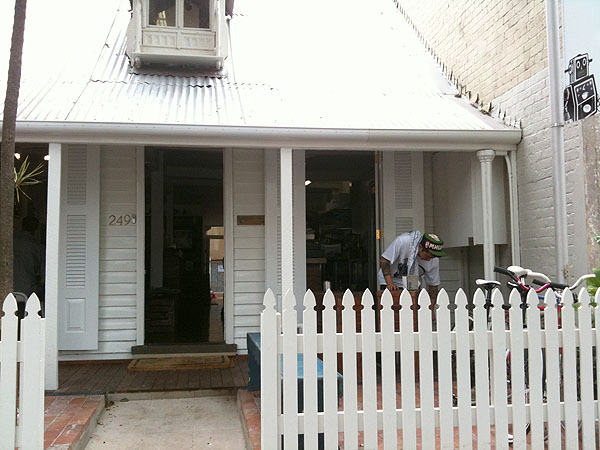 First there was Redfern’s Moose General Store, which got rolled by Sydney City Council over its sidewalk seating, then Chalmers Street’s Eat House decided serving breakfast and lunch was too much and started focusing on dinners only. So it is with great pleasure that I announce a week-old newcomer in Surry Hills called Robo Cog – as in robots and bicycle cogs. A natural combination, no? Well, the robots appear to be a bit of a fascination by the Bangkok boys (with unfairly cool names like “House” and “Jet”) who run this new café, with toy robots invading the shelving and various robot motifs on display, from the walls to the bathrooms. Then there’s the cycling element, which is equally inspired. The operators are bike geeks who have been running a neighbourhood bike repair and maintenance service just down the road. In a beautiful, blatant lack of commercial viability, they work on bikes or help people service their own two-wheelers and charge – wait for it – a$3 donation for the honour. In a materialistic city like Sydney, such a transaction may cause people to feel like they’ve woken up in Bizarro World. 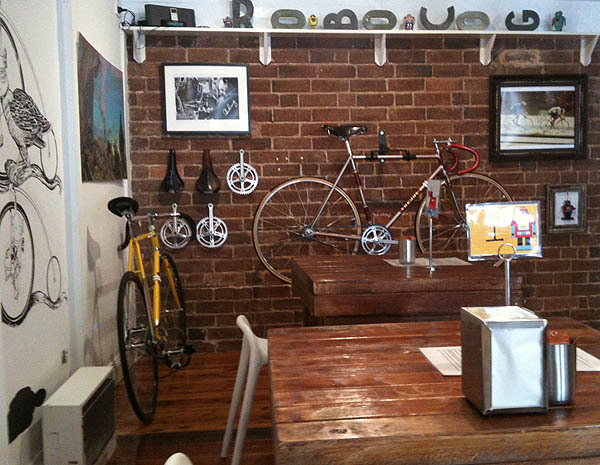 In the café, there are bicycles hung along the brick walls, a weekly feature that rotates bikes by customers who want to store and show off their pedallers. Many locals might not have even noticed Robo Cog’s arrival, as it subtly took over a cottage on Riley Street that has long operated as one the city’s worst cafés in one of the city’s best café spaces. No longer. Not only do the Thai barrisas pour a sweet cappuccino, but they’re also roasting their own coffee on premise, using North Ryde’s Green Bean beans. The house blend is a mix of Ethiopian and… erm, something else that I can’t remember, with a fruity, nutty taste that’s solid, although I get the sense that they’re still working out the best roasting process. With such passion about, it feels like it’s just a matter of time. The crew also showed me a bag of coffee beans grown in Chang Rai, in Thailand’s north, which they’re experiment with for a unique espresso option. The other clincher with Robo Cog is the price. Food starts here a gold-coin prices and then tops out at $9. At most Surry Hills cafes, that will buy you toast, but here it gets you a full-fledged breakfast. I started with a bacon-egg roll that cost little more than my coffee – decent, if a bit pedestrian – and at these prices, I should be able to get through the rest of the menu in about a week. See you there tomorrow, and don’t forget to bring some change. This places sounds amazing! Can’t wait to visit. 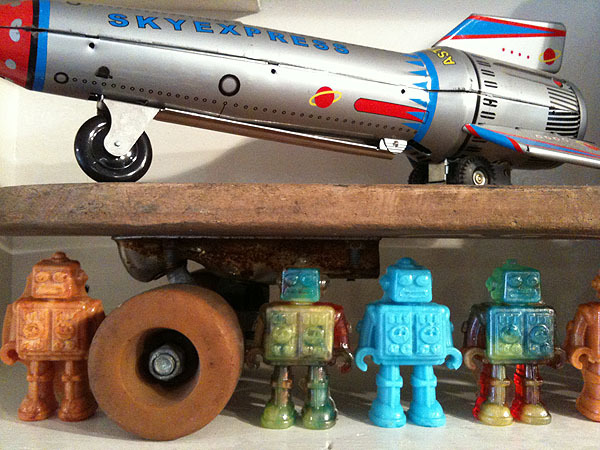 I heart robots! And it’s so reasonably priced, so it’s well within the budget of “The Richest Girl in Bondi”. Just popped past for my morning coffee on way to work. Awesome coffee, fantastic fit-out and vibe (yes the owners are well cool) and will be back for more. can’t wait to try their food. Awesome Clare. Hope you enjoyed it. Comments like yours remind me of why I love sharing these kinds of experiences. Great vibe there. I’m still waiting for them to get their DA approval for the full kitchen. The breakfast trifle there is terrific, although I found their hollandaise overly creamy – not sure if it needs more acid, or less butter, but it needs something to add a more rounded flavour. I mentioned it to the boys, and they seemed to take it on board.